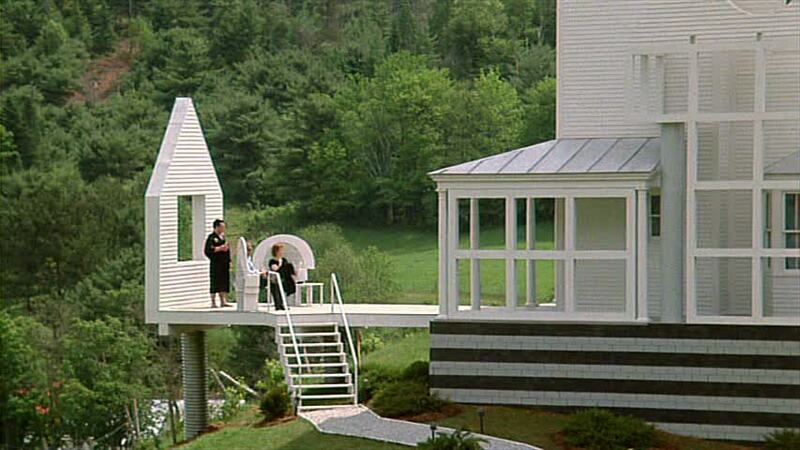 One of my favorite houses ever is the house from Beetlejuice after Delia Deetz (Played by WORLD TREASURE Catherine O’Hara) revamps it completely. It’s the perfect combination of old timey East Coast glamour and 80s ridiculousness. I know that we’re supposed to hate that house because it represents O’Hara’s crazy character but I have always loved it and wanted to live there. Being that I love that Beetlejuice house so much, it should come as no surprise to you that I love this amazing home designed by Michael Haverland. It’s called Shelter Island and, boy, would I love to shelter my island in that place. Sorry, I don’t really know what that meant. But I’m pretty sure it was gross. I’m so sorry. The lines. The color. That American gabled roof. The geometry of the window panes. The verticality. It all screams Beetlejuice. In the best way possible. “Sadly, this house has totally ugly views.” Said no one ever. I love this dining room with its glamourous, high white ceilings. I don’t love those sunflowers though. Not one bit. Get out my house, sunflowers! That chandelier is whatever but those floor-to-ceiling windows! I love them. I want to practice French kissing on them. wouldn’t you just love to wake up to those windows? The sunshine streaming in to wake up, the condensation still there from the night before when your stalker stood right outside, steaming the window panes with his nostrilbreath. This room does everything right. Just allowing all that natural gorgeousness to come through the glass. I want to die and come back as that arc lamp. So I can stare out the window all day and think about how beautiful I am. I think the living room is maybe a bit busy, but I applaud them for choosing such a bold, Candyland color scheme. Actually, the color scheme was probably inspired by the genius video for Katy Perry’s California Girls. The gabled ceiling gets a little confusing here, but the simplicity of the decor makes up for it. The simplicity of the color palette definitely helps too. Unlike the living room, this room is serene. Yet the yellow provides just the pop of color so that whoever sleeps in there wont be totally bored and sad. I can’t really tell what’s going on with this bathroom, but I know I like it. So there you go. A Beetlejuice house that manages to be both ridiculous and chic. Just. Like. YOU! Thank you! There are certainly a lot of good ideas there to think about–I really like that house! But I’d change the furniture. And pretty much everything else. But I’d still use a lot of those ideas. This house! The definition of iconic American gothic. I’ve always loved the exterior of the Beetlejuice house, too! Made a huge impact me as a kid. I love your blog! I laugh out loud at least once while reading each post. OMG! I’m glad someone else finally cops to liking the Beetlejuice house too! And this one is so reminiscent of that one! Some of the interior are…interesting, but I’d totally take it! I think I should include one more exclamation! It seems that all the extra colors in the house escaped into the living room. The sunflowers were a nice touch though, please don’t tell me you’d go with a random branch.